Mouth rinse as an adjunct to other oral hygiene measures was first propagated by ancient Egyptians and Romans. In the 16 th century, a mixture of alum, vinegar myrrh, and wine was reported to have been used for washing the mouth after meals. Hippocrates is also known to have advocated mouth rinsing with a mixture of alum, salt, and vinegar in ancient times. Mouth rinses are used generally for their analgesic, anti-inflammatory, antimicrobial, and anticariogenic activities. The most commonly used preventive and therapeutic mouth rises in children are sodium fluoride and chlorhexidine, respectively, for their anticariogenic effect because dental caries is the most prevalent chronic childhood disease. Various studies have compared the natural against the gold standard mouth rinses and reported varying degrees of efficacy, especially against S. mutans, ,,,, but there is a paucity of reports comparing the various natural mouth rinses. Also, to our knowledge, there are no reports of studies comparing the antimicrobial efficacy against C. albicans, a fungus being implicated in the etiopathogenesis of dental caries. This study was undertaken to evaluate and compare the antimicrobial efficacy of sodium fluoride (0.05%), fluoride with essential oils (0.05%), alum (0.02 M), green tea, and garlic with lime mouth rinses to that of chlorhexidine (0.2%) against S. mutans, lactobacilli, and C. albicans. The null hypothesis was that there was no statistically significant difference in the anti-microbial activity of each of these mouth rinses. This is an in vitro pilot study, which is a part of a larger randomized control trial. The study protocol was reviewed and approved by the ethical committee of the institution. Written informed consent was taken from parents of the children who were included in the study. The laboratory-formulated mouth rinses were prepared under aseptic conditions. Alum (0.02 M) mouth rinse was prepared by taking weighed quantity of potassium aluminum sulfate which is found in its doctahydrate form [molecular formula KAl (SO 4 ) 2·12H 2 O]. It was calculated using its molecular weight: 474.39 (wt of alum) = mol. wt × 0.02 = 9.4878 g. Initially, it was dissolved in 800 ml of distilled water and to it, 1 g of sodium benzoate as a preservative and 0.5 g of sodium saccharine (as a sweetening agent) were added. To 200 ml of distilled water, 0.5 ml of Tween 20 and 0.5 ml of peppermint oil were added and mixed properly. The resultant mixture was mixed with the 800 ml alum solution with the help of a propeller to formulate a clear mouth rinse. The saliva samples were cultured on selective media such as Mitis Salivarius Agar enriched with bacitracin, Rogosa agar, and CHROM agar to obtain isolates of S. mutans, lactobacilli, and C. albicans, respectively. Selective agar media were sterilized by autoclaving after the addition of 1% potassium tellurite supplement and then poured on sterile petri plates. After cooling to around 50%, they were allowed to set for 24 h and finally, the saliva samples were taken in serial dilutions. The plates were incubated at around 37°C in the biological incubator for 24-48 h and clear colonies were seen on the plates, indicating the growth. The agar well-diffusion method prescribed by National Committee for Clinical Laboratory Standards (2000) was employed to analyze the antimicrobial efficacy. Suspensions of the microbial isolates were prepared in sterile normal saline and adjusted to 0.5 McFarland's standard, and were uniformly seeded by streaking sterile swab dipped in the suspension onto the Muller-Hinton agar plate surface. Wells, 5 mm in diameter and 4 mm deep, were punched on the agar plates with a sterile borer. Fifty microliters of different mouth rinses and water as a negative control were placed in each of the wells and the plates were incubated at 37°C for 24 h.  The diameter of the zone of inhibition of each mouth rinse against each microbe was measured in millimeters and recorded on three culture plates using a Vernier caliper. Each measurement was repeated three times and the mean diameter of the zone of inhibition was determined. A single examiner carried out all the measurements. The examiner was calibrated and the intraexaminer reliability coefficient was found to be 0.84. The data were subjected to descriptive statistics and individual scores were tested using Kruskal-Wallis test, Wilcoxon rank sum test, and Mann-Whitney test using the SPSS software. The results were considered statistically significant at 0.05 probability level. The six studied mouth rinses showed considerable inhibitory effect against S. mutans, lactobacilli, and C. albicans. [Figure 1] shows the mean zone of inhibition; which was numerically highest for chlorhexidine (0.2%) mouth rinse against S. mutans and lactobacilli, whereas against C. albicans, the mean zone of inhibition was highest for garlic with lime mouth rinse. A very high significant difference was found between the mean zones of inhibition of the different mouth rinses for all the three microbes [Table 1]. [Table 2] shows the intercomparison of the antimicrobial efficacy of the different mouth rinses against the three microbes. Against S. mutans and lactobacilli, chlorhexidine mouth rinse was the most effective as compared to sodium fluoride (P < 0.001, P < 0.001), fluoride with essential oils (P < 0.001, P < 0.001), alum (P < 0.001, P = 0.023), green tea (P < 0.001, P < 0.001), and garlic with lime (P = 0.02, P < 0.001) mouth rinses. 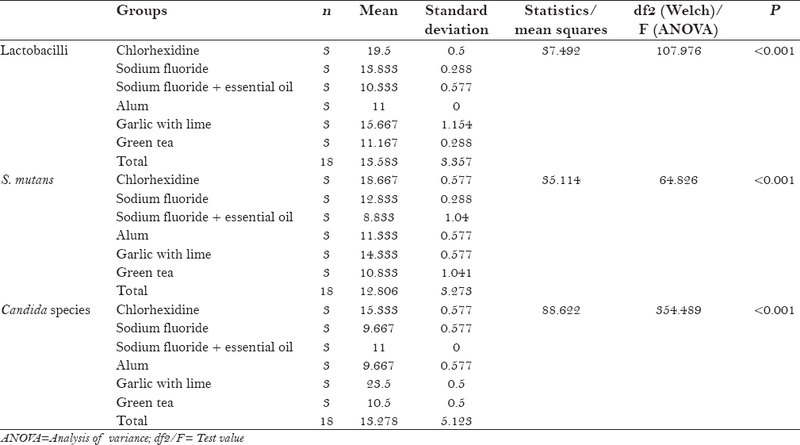 Garlic with lime mouth rinse was found to be the second most effective mouth rinse when compared to sodium fluoride (P = 0.053, P = 0.001), fluoride with essential oils (P < 0.001, P < 0.001), alum (P < 0.001, P < 0.001), and green tea (P < 0.001, P < 0.001) mouth rinses. Sodium fluoride mouth rinse was more effective than alum (P = 0.02, P = 0.001), green tea (P = 0.053, P = 0.001), and fluoride with essential oil (P < 0.001, P = 0.001) mouth rinses against S. mutans and lactobacilli, respectively. No significant difference was found between alum and green tea mouth rinses against S. mutans; however, they were more effective than fluoride with essential oil mouth rinse (P = 0.013, P = 0.053). No significant difference was found between the antimicrobial efficacy of alum, green tea, and fluoride with essential oil mouth rinses against lactobacilli. The intercomparison of the antimicrobial efficacy of the different mouth rinses against C. albicans revealed that garlic with lime mouth rinse was significantly the most effective as compared to chlorhexidine (P < 0.001), sodium fluoride (P < 0.001), fluoride with essential oils (P < 0.001), alum (P < 0.001), and green tea (P < 0.001) mouth rinses, whereas chlorhexidine mouth rinse was the second most effective when compared to sodium fluoride (P < 0.001), fluoride with essential oils (P < 0.001), alum (P < 0.001), and green tea (P < 0.001) mouth rinses. Fluoride with essential oil mouth rinse was found to be more significantly effective than alum (P = 0.058) and sodium fluoride (P = 0.058) mouth rinses, but no significant difference was found in comparison with green tea mouth rinse (P = 0.817). Also, no significant difference was found between green tea, alum, and sodium fluoride mouth rinses in their efficacy against C. albicans. The most common dental diseases are plaque-related infections. In recent years, there has been a lot of concern about caries prevention, especially in the developing countries and lower socio-economic societies. Hence, there is always a quest for natural mouth rinse which is economical, safe, and easy to prepare, in order to achieve better oral health with widespread use as a home remedy. In garlic with lime mouth rinse, a herbal formulation, lime was added to mask the pungent flavor of garlic and it also provided antifungal effect. The characteristic flavor of allicin in garlic induces salivation and salivary clearance, thus providing an additional benefit on caries prevention. , This mouth rinse was found to be the second most significantly effective antibacterial mouth rinse and the most effective antifungal mouth rinse, when compared to the studied mouth rinses. The in vitro antibacterial and antifungal activities of garlic extract have been widely recognized. ,,, Our finding indicates that this mouth rinse can be a very cost-effective formulation which can be easily formulated at home and may lack possible side effects with long-term use, and therefore, it could be considered a good mouth rinse for use as a home oral hygiene measure, especially in low socio-economic groups. However, there is limited data regarding this mouth rinse, which precludes its approval for the clinical prescription at present. The present study also confirms that sodium fluoride mouth rinse is a potent antibacterial with antifungal ability and this finding is in agreement with previous reports. , Fluoride with essential oil mouth rinse is a newer commercially available mouth rinse with the rationale of treating or preventing both dental caries and gingivitis. A number of well-conducted studies have demonstrated the effectiveness of essential oils against gram-negative flora associated with gingivitis and, to some extent, against gram-positive organisms including S. mutans. , The ability of sodium fluoride to significantly reduce or even reverse the initiation and progression of dental caries is also well documented. ,, The fluoride content in both fluoride with essential oils and sodium fluoride mouth rinses used in this study was 0.05%; yet, sodium fluoride mouth rinse was found to be significantly more efficacious than fluoride with essential oil mouth rinse against the cariogenic bacteria. This finding is contrary to the general hypothesis of the added benefit of essential oil in a fluoride with essential mouth rinse. It could be suggested that the number of available active free fluoride molecules is reduced in fluoride with essential oil mouth rinse. However, fluoride with essential oil had greater antifungal effect against C. albicans than sodium fluoride mouth rinse and was also significantly better than alum mouth rinse, while no difference was found with green tea mouth rinse. Studies have indicated alum to be an effective antibacterial agent, especially against the oral bacteria. 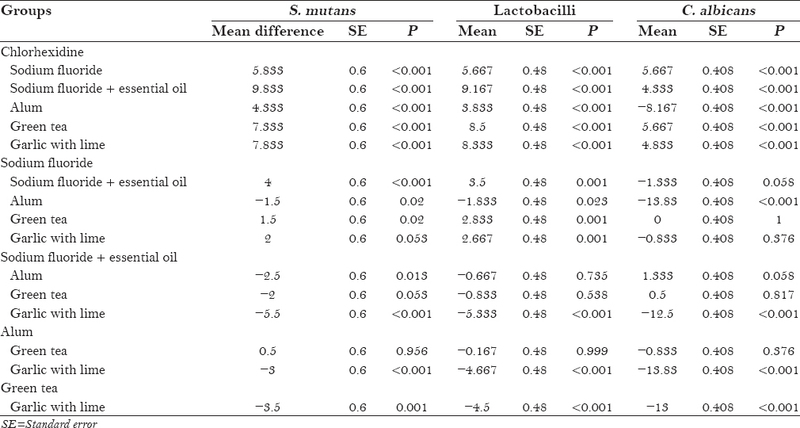 In our study, alum (0.02 M) mouth rinse showed modest but definite inhibitory effect against the studied microbes, especially S. mutans and lactobacilli. Its antifungal effect was similar to sodium fluoride mouth rinse. From the results of this study, it can be concluded that chlorhexidine and garlic with lime are the most effective antibacterial and antifungal mouth rinses, respectively, among the six studied mouth rinses. Garlic with lime mouth rinse has shown promising results, and thus, it can be considered a newer alternative; but further studies on its side effects and long-term use are recommended. Fluoride with essential oil, alum, and green tea mouth rinses had modest effects which were not as comparable to that of sodium fluoride mouth rinse. Putt MS, Kleber CJ, Smith CE. Evaluation an alum-containing mouthrinse in children for plaque and gingivitis inhibition during 4 weeks of supervised use. Pediatr Dent 1996;18:139-44. Sundas S, Rao A. Comparative evaluation of chlorhexidine and sodium fluoride mouthwashes on streptococcus mutans. J Nepal Dent Assoc 2011;12:17-21. Tehrani MH, Asghari G, Hajiahmadi M. Comparing Streptococcus and Lactobacillus colony count changes following green tea mouth rinse or sodium fluoride mouth rinse use in children (Randomized double-blind controlled clinical Trial). Dent Res J (Isfahan) 2011;8(Suppl 1):S58-63. Zero DT, Zhang JZ, Harper DS, Wu M, Kelly S, Waskow J, et al. The remineralizing effect of an essential oil fluoride mouthrinse in an intraoral caries test. J Am Dent Assoc 2004;135:231-7. Benjavongkulchai E, Tamsailom S. Fluoride/zinc/essential oil-containing mouthrinse promotes fluoride uptake and microhardness in enamel in vitro. CU Dent J 2013;36:31-6. Rupesh S, Winnier JJ, Nayak UA, Rao AP, Reddy NV. Comparative evaluation of the effects of an alum-containing mouthrinse and a saturated saline rinse on the salivary levels of Streptococcus mutans. J Indian Soc Pedod Prev Dent 2010;28:138-44. Kukreja BJ, Dodwad V. Herbal mouthwashes: A gift of nature. Int J Pharma Bio Sci 2012;3:46-52. Owhe-Ureghe UB, Ehwarieme DA, Eboh DO. Antibacterial activity of garlic and lime on isolates of extracted carious teeth. Afr J Biotechnol 2010;9:3163-6. Fani MM, Kohanteb J, Dayaghi M. Inhibitory activity of garlic (Allium Sativum) extract on multidrug-resistant Streptococcus mutans. J Indian Soc Pedod Prev Dent 2007;25:164-8. Ankri S, Mirelman D. Antimicrobial properties of allicin from garlic. Microbes Infect 1999;1:125-9. Kudva S, Prabhakar S, Pai V, Tegginamani A. Effects of garlic extract on salivary pH: A clinical study. Arch Orofac Sci 2012;7:1-8. American Academy of Pediatric Dentistry; American Academy of Pediatrics; American Academy of Pediatric Dentistry Council on Clinical Affairs. Policy on early childhood caries (ECC): Classifications, consequences, and preventive strategies. Pediatr Dent 2005-2006;27(Suppl):31-3. Amin M, Kazemi M, Rasaie N. In vitro comparison of the effects of garlic juice and chlorhexidine mouthwash on oral pathogens. Jundishapur J Microbiol 2012;5:398-400. Chavan SD, Shetty NL, Kanuri M. Comparative evaluation of garlic extracts mouthwash and chlorhexidine mouthwash on salivary Streptococcus mutans count-an in vivo study. Oral Health Prev Dent 2010;8:369-74. Oyanagi T, Tagami J, Matin K. Potentials of mouthwashes in disinfecting cariogenic bacteria and biofilms leading to inhibition of caries. Open Dent J 2012;6:23-30. Iwalokun BA, Ogunledun A, Ogbolu DO, Bamiro SB, Jimi-Omojola J. 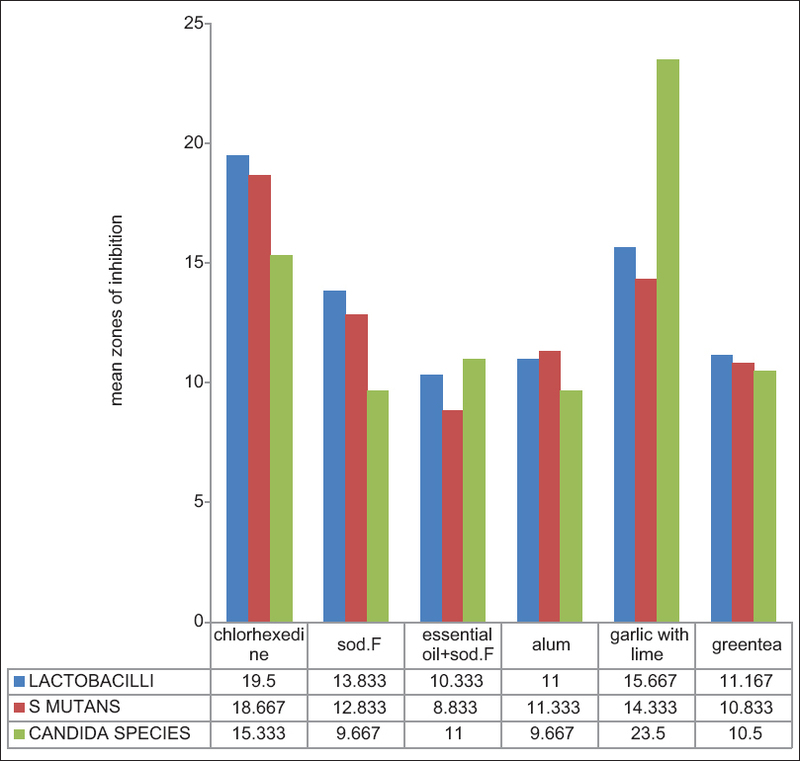 In vitro antimicrobial properties of aqueous garlic extract against multidrug- resistant bacteria and Candida species from Nigeria. J Med Food 2004;7:327-33. Overholser CD, Meiller TF, DePaola LG, Minah GE, Neihaus C. Comparative effects of 2 chemotherapeutic mouthrinses on the development of supragingival dental plaque and gingivitis. J Clin Periodontol 1990;17:575-9. DePaola LG, Overholser CD, Meiller TF, Minah GE, Neihaus C. Chemotherapeutic inhibition of supragingival dental plaque and gingivitis development. J Clin Periodontol 1989;16:311-5. Finn SB, Moller P, Jamison H, Regattieri L, Manson-Hing L. The clinical cariostatic effectiveness of two concentrations of acidulated phosphate-fluoride mouthwash. J Am Dent Assoc 1975;90:398-402. Hassani AS, Amirmozafari N, Ordouzadeh N, Hamdi K, Nazari R, Ghaemi A. Volatile components of Camellia sinensis inhibit growth and biofilm formation of oral streptococci in vitro. Pak J Biol Sci 2008;11:1336-41.